There are too many brands in the marketplace that just don’t get it. Their owners think their brand is a logo and a tagline. Or that a generic mission statement like “Provide the highest quality products in our industry at a fair price” actually differentiates them from their competition. These companies may have meetings to talk about “brand strategy,” but their actions are largely tactical. Their brands are superficial. Taglines come and go, but their business decisions rarely consider the effect on the brand. These businesses may be successful, but often they trail a competitor that looks at their brand as a strategic asset. Those companies invest in their brand and they continually monitor its strength. In short, they lead with their brand. Brand-centric companies know that almost any product can be copied, but a brand can be truly unique. They don’t just talk about their brand—they walk the walk. Ask someone who works at Coca-Cola or Apple about the importance of their brand and get ready for an earful. They’ll tell you how everything they do is expected to be a reflection of the brand—for Coke, that means focusing on sharing moments of refreshment with others. Their employees know the product is flavored sugar water, but the brand is about community as well as quenching thirst. Apple employees will tell you about how their brand is focused on creative self-discovery—learning about new ideas and new ways to be unique. For one of those brands, the product never changes; for the other, there are constant upgrades and sometimes revolutionary changes (the iPhone is only 10 years old, but flip phones seem like antiques already). Yet for both Coke and Apple, the brand doesn’t change, even if the words and images evolve that they use to tell us about them. Being your brand can actually empower an organization, because defining a brand in simple and appealing terms frees an organization to move forward with focus and confidence. When Pampers changed their brand concept from preventing diaper rash to helping mothers raise healthier, happier babies, the brand rapidly gained market share. The clarity of moving from a brand built on product features, (tactical) to one built on a true strategy of helping mothers, made decisions like donating diapers for premature babies to every NICU in the country a simple one. So how do you go about being your brand? Start by checking your brand strategy. Is it focused on your product or your customer? Of course, your product or service is part of the equation, but your brand is really only about how your customer perceives you and your relevance to them. Your customer doesn’t care about your sales goals. They care about how your brand makes them feel about themselves. Next, look at how your employees understand the brand. Can they describe it in a few words? Are they enthusiastic about it? Does the leadership of your company seem to care about the brand and how it helps the customer? 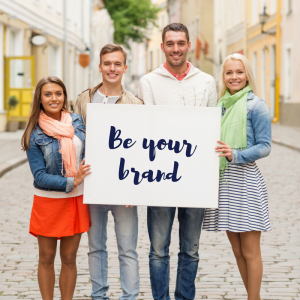 Answer yes to these questions, and you’re well on the way to being your brand. Walk the walk. Live it. Work it. Be your brand and you’ll be successful.